Playing Time: 30 - 45 min. The Wonderful World of Disney Trivia game put both adults and children at the same playing level and makes it so they can both enjoy the same game. The Wonderful World of Disney Trivia game includes 1600 questions for grown-ups and 800 questions for kids. Questions in the game come from many different categories such as Disney movies, theme parks, music, characters including some questions from Touchstone Pictures. The children's questions pertain to specific characters to make them a little bit easier. The difference in questions allows children and adults alike to enjoy this fun game while testing your knowledge of Disney movies. If you play this game frequently you may feel like you could use more of a challenge so extra boxes of questions are available. Work alone or with a team and see how you do in the fun game of The Wonderful World of Disney Trivia. To be the champion of The Wonderful World of Disney Trivia game you need to be the first player to collect 5 different colored Mickey Mouse tokens by answering 1 questions correctly from each category. Then make your way to "The End" space to answer one final question. The Wonderful World of Disney Trivia game includes game board, 1 box of cards (containing 2 decks: 400 adult trivia cards and 100 kids' trivia cards), 4 Mickey Mouse movers (gold, silver, black, white "posts"), 20 colored mickey mouse tokens (4 each: red, blue, yellow, green, purple), 1 die, 4 category reference cards, and the Wonderful World of Disney Trivia rules and instructions. Please keep in mind that the official World of Disney Trivia childrens rules and instructions could be different depending on the game version you have. 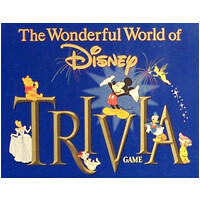 The rules below are some of the exact directions on how to play World of Disney Trivia. Share with us your comments, funny stories, tips, advice, strategies, creative ways to play, questions about how to play, problems with the rules or anything you want about World of Disney Trivia. All submissions will be reviewed within 24 hours. Click here to add your Wonderful World of Disney Trivia comments.